"Eboracum, Lincolnia, Derbia, Stafford, etc.". Orig. 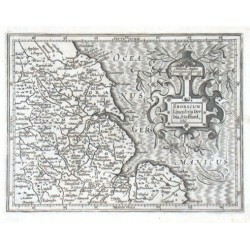 copper-engraving from Mercator's Atlas Minor published in Amsterdam by J. Hondius, 1609. 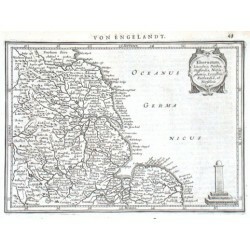 With great ornamental title-cartouche with a scale of map ("Milliaria Anglica"). 13:17 cm.